no roaches, no dirty carpets or dirty blankets. Everything clean, pool clean. Nice staff. kind and helpful. Close to fast food restaurants. Really nice. we got to the hotel late, 1:30 am. call the hotel number on the itinerary never received a response. I had to sleep in my car. there was no trash can in the room for waste, the large trash can out side was overflowing each morning. each morning there was no hat water to take a shower. the A/C was so loud I had to wear ear plugs. Very nice Hotel, room services was on point...and the Staff were very friendly! Had to call maintenance 3 times for hot water tank. And one time for the AC unit and did not work because it was after hour so we had to sleep without AC. They forgot to clean the room one day and one day they did not clean the bathroom. Bottom line I would recommend you guys take this hotel out of your site. I purchased from you not from satisfaction. This is your product. The room was horrible. There was hair all over the bed and it was super dusty. It had roaches and ants in it. There where men drinking and smoking outside. If you are from out of town this room and environment would scare you. I set my room up through orbitz so I didn’t get a refund and I still left that inn. When you think of Florida you think of a happy place. This was the Hood. for the $68 it cost, it was one of the better cheap rooms I stayed at, I will easily stay there again if needed. Clean, spacious, great value for a fair price. Definitely book this. This is the second time there I have a bad experience on hotel, qualities of hotel is no good. The bed was a full size bed. And very uncountable. the bed was very uncomfortable, at night there was no one in the front desk who was there. no security, that hotel is in a somewhat dangerous area I felt insecure. When they cleaned my room I had some towels and apparently I'm taking housekeeping. On our last day they finally put sheets on our bed. It had more than enough room for my family which includes 3 people! The room was clean and the atmosphere was nice! It was about 40 minutes from the parks. The staff was not very helpful. It’s overpriced in my opinion, not kids friendly. The bed headboard was a wood thing around it. The lights were not working all of them. The appliances were nice and it was spacious. Located in Historic Downtown Kissimmee, Satisfaction Orlando Resort is within a few miles (5 km) of popular sights such as Kissimmee Lakefront Park and Lake Tohopekaliga. This 200-room hotel welcomes guests with conveniences like an outdoor pool, free in-room WiFi, and free self parking. Guests can expect to find free WiFi and 47-inch a flat-screen TV with cable channels. The bathroom offers hair dryers and free toiletries. Other standard amenities include a refrigerator, a microwave, and a coffee maker. Satisfaction Orlando Resort offers an outdoor pool, an outdoor tennis court, and free WiFi in public areas. You can take advantage of free parking if you drive. The front desk has multilingual staff that can answer questions about the accommodations, services, and more. Additional amenities include a business center, express check-out, and laundry facilities. Thank you for taking the time to share your review with us. We appreciate your valuable feedback as it helps us identify the areas we can improve the guest experience. I was disappointed to learn of the shortcomings you experienced and we're currently taking steps to upgrade our rooms. Thank you for taking your time in providing feedback. Thanks you for staying with us! 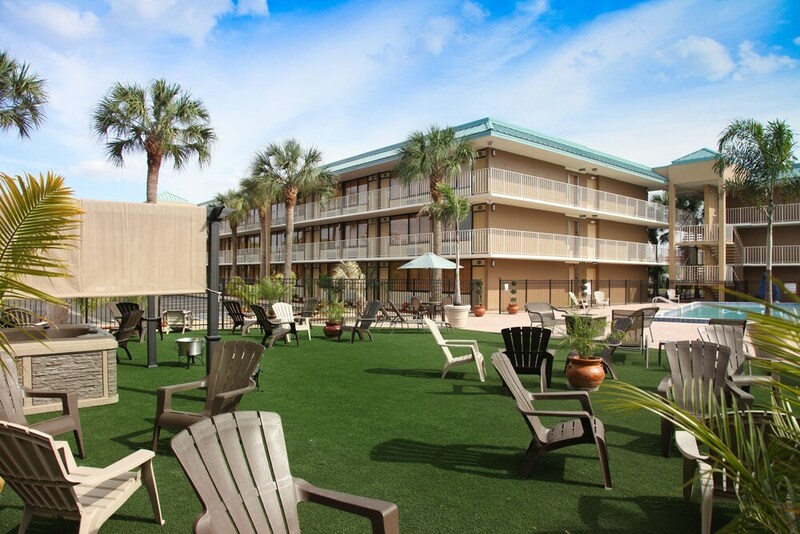 Recreation features at Satisfaction Orlando Resort include an outdoor tennis court and an outdoor pool. The front desk is available during limited hours, and checking out is easy with express services. Driving? This property offers free parking. This property's front desk is open daily from 8 AM - midnight.